Since we heard on 15th February last year that the Heritage Lottery Fund had awarded us a grant for £85,700 in connection with Tower Restoration and Bell Project we have had a year of good progress. The first component of this grant (50%) was released to Hawton Church at the end of March. This grant, together with the other money we have raised in a wide raft of initiatives, Has allowed 80% of the work to be completed. We had not realised the extent of wind and rain damage in the Tower and the degree of rot in our 15th century beams. We have been fortunate that none of the beams had actually collapsed before they were formally removed. We were very sorry that Harry Harrington was no longer with us to receive this news. He was a regular member of our Tower and Bells Restoration Group and his wise counsel was always appreciated. He died on 4th January, 2018 after a long struggle against the lung disease, mesothelioma, probably contracted while he was in the Royal Navy from contact with asbestos. Harry was a regular bell-ringer at St Peter's Church, Farndon, and continued this almost until the week of his death. He will be missed by many for his quiet demeanour, his extensive experience of bell-ringing and a life well spent, and his constant kindness. As a tribute to Harry the four Hawton bells were clocked (they cannot be rung formally as the frame is unsafe) by four ringers under the supervision of Geoff Wells, on the morning of 29th January, 2018, the date of Harry's funeral. The video of the occasion, taken by Peter Sargeant, is shown below. We are not sure when the Hawton bells were last heard but it was either 50 or 60 years ago, so both these are mentioned. You will also note that the bells are not exactly in tune and all the ringers have ear muffs. If you were there you would realise why. Harry took part in the promotional film for the Lottery Grant application that is also show below. The Watermeadow Mystery: the Secret Treasure of Hawton is also dedicated to his memory and will be acknowledged on the first page of the novel, published in June, 2018, which may be made into a film shortly. 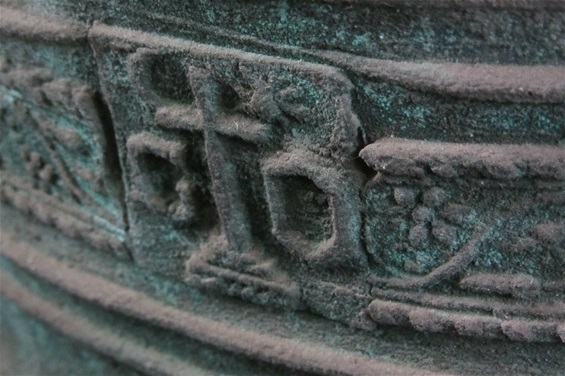 The inscription on the second recently cast bell is also dedicated to Harry. We need to replace the bells and ringing chamber in the West Tower of the church as otherwise there is a real danger of bell collapse and possible injury. The Tower, clearly visible across the fields around Hawton, was erected in 1482 and contains four bells in minor key, but these are currently unringable. 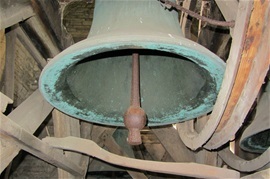 The ancient oak bell-frame also urgently needs repair and conservation. It is reported that our bells have not been pealed or rung in rounds for over 50 years (although one bell is still chimed as a Sanctus bell). The 50 year wait was ended on 29th January, 2018, when on the morning of the funeral of one of our most esteemed bell-ringers, Harry Harrington, when the four bells were hit with hammers and sounded again. The sound - not particularly euphonious, can be heard in the video above. The bell ringing floor has become unsafe and is currently closed. All our bells are the product of Nottingham bell founders, the listed second bell by Richard Mellors of 1482, coeval with the tower, and the remainder cast by George Oldfield: the tenor is of 1624 and the treble and third bell are both dated 1655 (during the Commonwealth period). The oak bell-frame dates from the 17th century with fittings, possibly early 20th century, by Whites of Appleton. Phase 1 - Ground Floor – Erect scaffolding, repair defective masonry, replace defective timber beam, re-board unsafe intermediate floor, remove scaffolding. Phase 2 – Ground Floor – Provide new oak and glass ringing gallery with access from tower stairway. Phase 3 – Belfry Level - Repair defective masonry, replace louvres, make watertight, apply preservative to existing timber bell-frame. Phase 5 – Intermediate Floor (High Level) - Provide new galvanised steel bell-frame, rehang with all new fittings three of the existing bells plus five additional bells, two being newly cast by Taylors of Loughborough. Rehang the existing treble bell for use as a Sanctus bell. The estimated costs of this project are around £200,000 of which we have, by June, 2018, raised £68,000. An application was also made to the Heritage Lottery Fund for the main part of the funding. You will note from the latest news at the beginning of this page that a grant of £85,700 has now been obtained from the Heritage Lottery Fund and the work on the project can now start immediately. With savings made on volunteer labour for the project we now feel that every part of the project can be achieved with an additional £9,000 of funding, so grant initiatives and fund-raising events are still needed. We are still dependent on offers of co-operation from several organisations, with building work free of charge from Newark Technical College, materials from Carters engineering firm and storage and transport from the local firm Pykett Brothers in Hawton village. Local building firms are being engaged to do the work. Much of the money raised thus far has been donated by local people and members of the congregation, and we are now asking you to let us know how and in what way you might be able to support this important project. The timescale deadline for completion of the restoration and new bell installation is 30th April, 2019. Please help us to meet this. On 14th December the first bell, the Lawrence Bell, was cast at John Taylor's Bell Foundry in Loughborough (see photograph). 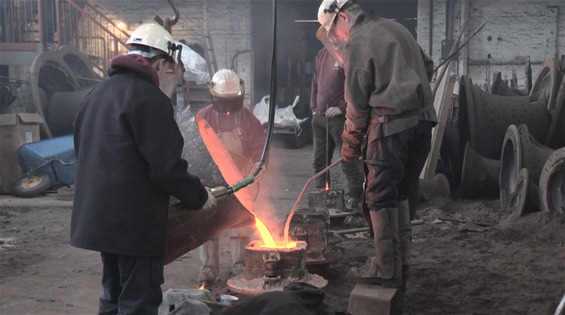 By kind permission of the Foundry, 33 people travelled from Hawton and Farndon to witness the casting and have a conducted tour of the Foundry by George Dawson. The Bell was donated by Charles Lawrence in memory of his parents. A peroration was read by David Britton after the casting of the Lawrence Bell. This was a highly evocative and moving occasion and all who attended will retain the memory of this event. It was filmed in full by Derek Smith as part of the history of Hawton Church through the ages. Derek will also be continuing his filming of all the events linked to the church as part of the Heritage Lottery grant plan, but his filming is very inconspicuous so hope it will not trouble anybody. Occasions such as weddings and special events may also be filmed. We will be putting forward the final film to national exhibitions as we are so pleased with its high quality and interest level. 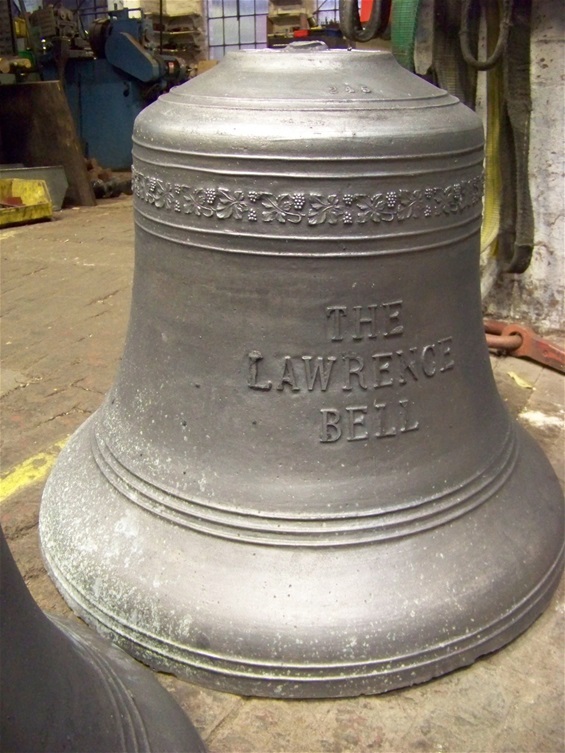 The casting of the Lawrence bell can be seen in the video above. The molten bell-metal is poured into a cast buried in sand. The final bell can be seen in the subsequent still photographs. This will be cast at John Taylor's Bell Foundry on 14th June, 2018 The occasion will again be filmed, so keep watching, and look at the events page of this web-site. 3. Pay to Southwell and Nottingham Diocesan Guild of Church Bell Ringers Fund "HAWTON CHURCH" via CAF (Charities Aid Foundation) Account No. 00088133 - SORT CODE 40-52-40. If paying to support the Watermeadow Mystery please put 'Watermeadow' in the second line of payment. Please mark cheques "HAWTON CHURCH BELL FUND"
GIFT AID - If you are a taxpayer, we can claim 25% of your donation from HMRC. Please use the "contact us" button to ask for a Gift Aid form from our church to complete. Or telephone us on 01636 679245 for further ways to donate, such as gifts in kind, voluntary skilled work on the bells, transport and fundraising at your place of work or worship to help us. We can offer donors a visit to John Taylor & Co in Loughborough to see the way bells are cast and, numbers permitting, a visit when our own bells are being cast. We had a great day watching this historic event and we look forward to hearing the Lawrence bell ring out from All Saints soon.